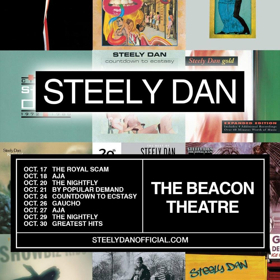 Steely Dan announced today that the band will return to The Beacon Theatre stage for a nine-night residency of themed performances starting October 17, 2018. The Rock and Roll Hall of Famers staged complete performances of several of their beloved classic albums from start to finish at The Beacon in 2008, 2009, 2011, 2013, 2015, and 2016. Included among the highlights of this year's extraordinary concerts are: performances of Steely Dan's Countdown to Ecstasy (1973), The Royal Scam (1976), Aja (1977), Gaucho (1980), plus Donald Fagen's solo album The Nightfly (1982), plus "By Popular Demand" and "Greatest Hits" nights. Each and every night, Steely Dan will also treat audiences with selections from The Dan's extraordinary catalog, packed with infectious tunes, bodacious harmonies, irresistible grooves, blazing solo work, rich ensembles and sleek, subversive lyrics. For the October concerts, American Express cardmembers can purchase advance tickets beginning Tues., Mar. 27 at 10 a.m. EDT through Thurs., Mar. 29 at 10 p.m. EDT. Tickets will go on sale to the public on Fri, Mar. 30 at 10 a.m. EDT and can be purchased through Ticketmaster outlets, Ticketmaster.com or charge-by-phone at 1-800-745-3000.